Properties in Madrid average 4.4 out of 5 stars. BEAUTIFUL APARTMENT WITH SUNNY TERRACE AND GARAGE NEAR. 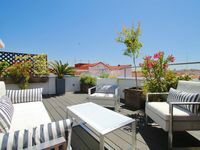 TOGETHER WITH QUEEN SOFÍA, PRADO ..
Property 52: BEAUTIFUL APARTMENT WITH SUNNY TERRACE AND GARAGE NEAR. TOGETHER WITH QUEEN SOFÍA, PRADO ..
Acacias Oasis IV apartment in Embajadores with WiFi & lift. Property 57: Acacias Oasis IV apartment in Embajadores with WiFi & lift. FAB APART. WITH TERRACES SWPOOL FRONT OF PRADO MUSEUM. Property 72: FAB APART. WITH TERRACES SWPOOL FRONT OF PRADO MUSEUM. Lovely apartment in MADRID CENTER ! Property 81: Lovely apartment in MADRID CENTER ! Bright place, Gran Via Views Great Wifi & balconies over gran via ST.
Property 86: Bright place, Gran Via Views Great Wifi & balconies over gran via ST.
Beautiful apartment, in the middle of much and very quiet sleeping which was so important to me. Ludovic was an amazing host. Thank you for a lovely stay! Elena and Luisa were both great at connecting and so helpful with much information. The apartment was clean, well stocked and the location is perfect! Thank you both for a wonderful time in Madrid.